I've used Emerald to give spectacular window decoration in Ubuntu, and many other OSes including FreeBSD and Linux Mint, for many years. 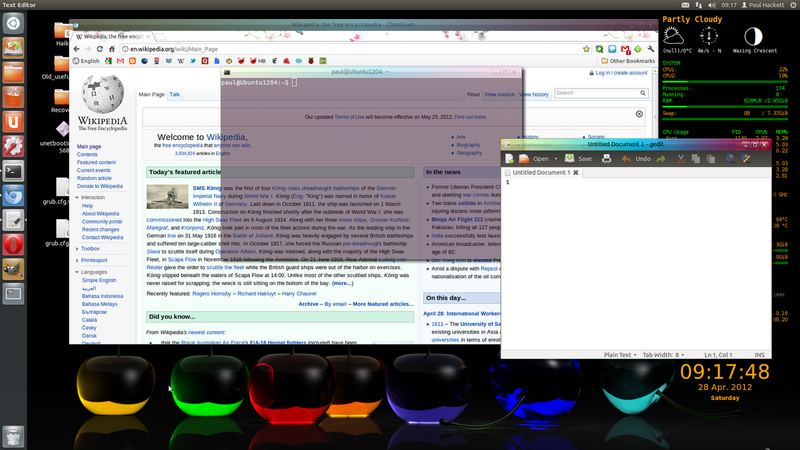 The screenshot shows how my Ubuntu 12.04 looks right now (I should warn that if you are subject to violent bouts of jealousy, you might want to avoid looking at my screenshot). But now it's no longer available in the Ubuntu repos for reasons I'm not aware of. I'd already posted about the same situation for Ubuntu 11.10. In 11.10, I used this link to get Emerald working and it worked without problem. However, this is no longer functional (can't remember whether the link is dead or not).. Indeed, I came across quite a few other supposed means to get Emerald operational in more recent versions of Ubuntu such as this, this and this too. Quite a lot of apparent solutions but. unfortunately, none of these work in 12.04. But, this one does, and works beautifully. 8. Use Emerald Theme Manager to import new themes and select. 9. Create a small script to start Emerald at boot. Save as a file, make it executable and add to StartUp Applications. Note that the initial $ sign in steps 1, 3, 5 and 6 is NOT part of the command and just indicates that the command is run as normal user rather than as root (which would be symbolized with #). that was sick, worked great. thx sooo much.